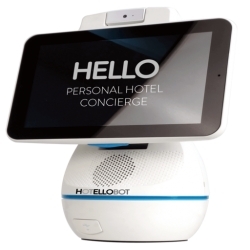 London, United Kingdom, September 07, 2018 --(PR.com)-- Hotellobot is an ingenious guest information service software that can be paired with Hotellobot Robot Hardware to make the world’s first and only personal hotel concierge robot. Hotellobot Software can be used in conjunction with Amazon Dot Voice Hardware, Amazon Spot Screen Hardware or Hotellobot Robot Hardware to provide an exceptional, user-friendly, guest information system. With a vocal command or touch of the screen, depending on which hardware is used, Hotellobot is able to provide guests with information specific to their hotel stay- including menus and timetables. Hotellobot is a multifaceted, unique software and robot hardware, that will provide support to guests, staff, and hoteliers alike. Hotellobot will bring an adroit, previously unchartered dimension to concierge and guest services. Technology in hotel rooms is a step towards a more efficient, cutting-edge business model. The 24-hour, unlimited nature of Hotellobot’s functionality will transform the accessibility of guest services, as well as eradicate unnecessary calls to reception desks.